Our goal? Cost savings with high accuracy rate. Tool edge preparation is one of the four main factors in successful cutting tool manufacturing. The other three factors include tool substrate composition, tool geometry, and proper coating. While considerable resources have been channeled into making the processes of tool composition, tool geometry and coating more reliable and repeatable, tool edge preparation is fast becoming a necessity on all cutting tools manufactured of cemented carbide because of increased performance demands. Edge defects are present in nearly all tools prior to edge prep.The defects are the result of the grinding process. Although microscopic in size, these defects must be eliminated to achieve optimum tool performance. The tool edge preparation process adds strength to the tool cutting edge, lengthens usable tool life, minimizes the propensity of the edge to chip, improves part quality and consistency, and enhances work piece surface finish. 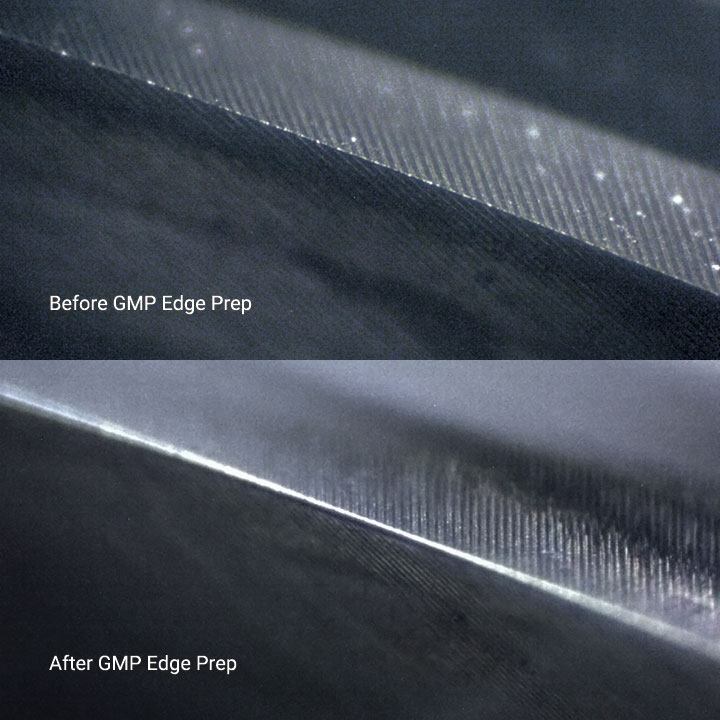 With GMP Edge Prep, we have taken edge preparation to the next level, making it a science. Now the technology and equipment exists to overcome nearly all the current processing problems and to produce a tool that will yield optimum performance in any given operation or application.